"Progress and Challenges in the Structural Characterization of Nanoporous Materials by Physical Adsorption"
A comprehensive textural characterization of nanoporous materials has become more important than ever for the optimization of novel systems used in many important existing and potentially new applications. The most popular method to obtain surface area, pore size, pore size distribution and porosity information from powders and porous solids is gas adsorption. Within the last two decades major progress has been achieved in understanding the adsorption and phase behavior of fluids in ordered nanoporous materials and in the development of advanced approaches based on statistical mechanics such as molecular simulation and density functional theory (DFT) of inhomogeneous fluids. This progress, coupled with the availability of high resolution experimental procedures for the adsorption of various subcritical fluids, has led to major advances in the structural characterization by physical adsorption. Recently, new challenges emerged concerning the surface and structural characterization of nanoporous materials with more complex pore structures such as hierarchically structured porous materials (e.g., micro-mesoporous zeolites), novel nanoporous carbons, metal organic frameworks (MOFs). Within this context we will discuss recent advances, but will also reflect briefly on the existing challenges in physical adsorption characterization. Dr Matthias Thommes is Quantachrome's Director of Applied Science and heads Quantachrome's Science & Application department since 2001. He is also a Visiting Professor at University of Edinburgh, U.K and is currently the Principal Scientific Advisor to the new ARPA-E/DOE funded NIST/FACT laboratory. He holds leadership positions in a number of authoritative bodies in his field including: Vice Chair of Separations Division Area 2e, AIChE, Chairman of the IUPAC task group – "Physisorption of Gases, with Special Reference to the Evaluation of Surface Area and Pore Size Distributions". Convener of the International Standard Organization (ISO) Working Group on Surface Area and Porosity, and Chairman of ASTM C28-03(Physical Properties of Ceramics). Board of Directors of the International Adsorption Society (IAS) from 2007 -2013, Council Member of the International Mesostructured Materials Association (IMMA, 2006-2013). Dr. Thommes. is an Editorial Board Member of the journals Adsorption, Advanced Porous Materials and Particle & Particle Systems Characterization. Dr. Thommes has authored/co-authored more than 110 scientific papers, reviews and book chapters, patents as well as a monograph on the Characterization of Porous Solids and Powders. He has given more than 200 presentations including invited plenary and keynote lectures at prestigious international scientific conferences and universities all over the world. In addition Dr. Thommes has been co-chairing various important scientific conferences and symposia in the field of adsorption and materials characterization. 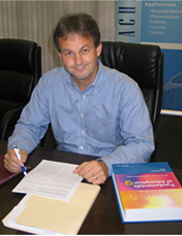 Dr. Thommes has received his Doctorate in Physical Chemistry in 1993 at the Technical University Berlin (1992/93). From 1992- 1995 Dr. Thommes was a Research Associate at the Iwan-N.-Stranski Institute of Physical and Theoretical Chemistry, Technical University Berlin and Project Scientist for a microgravity experiment on critical adsorption which was carried out on the EURECA mission of the European Space Agency (ESA). From 1996 to 1997, he was an ESA fellow and Postdoctoral Research Associate at the Institute for Physical Science and Technology at the University of Maryland at College Park, USA.In 1998 Dr. Thommes joined Quantachrome, first as the Head of Application Department at Quantachrome GmbH in Germany, and then in 2001 as Director of Applied Science at the Quantachrome Headquarters in Boynton Beach, Florida, USA.